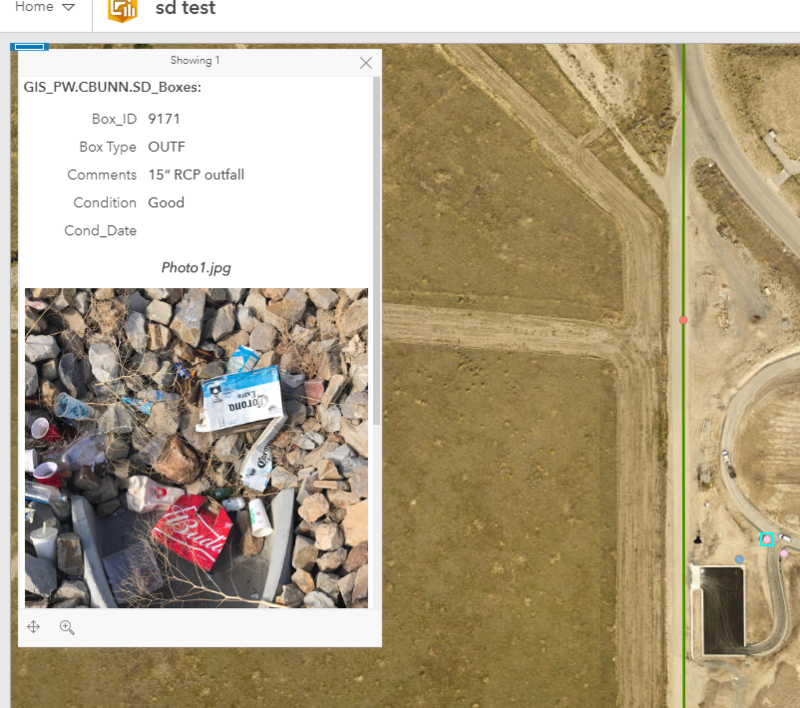 Show attached images inside popup with ArcGIS Online? 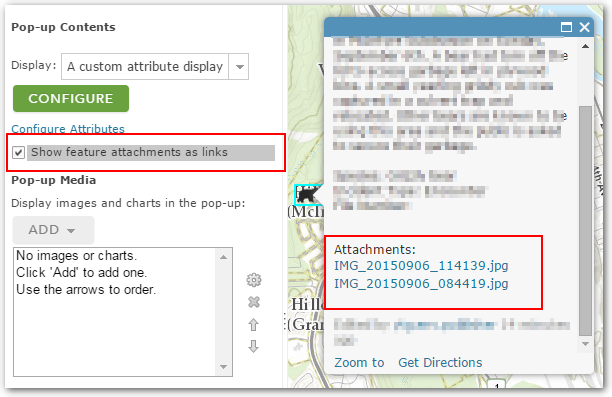 In ArcGIS Online popups how does one display attached images inline as an image instead of just a link? In case of multiple images I'm okay with just first one showing inline. Under "Configure Popup" checking " Show feature attachments as links" results in text-only links. If the "Pop-up Media" control is used to add an image, it shows inline, however one has to know the URL ahead of time. The drop down selector does not show attachments as a possibility. 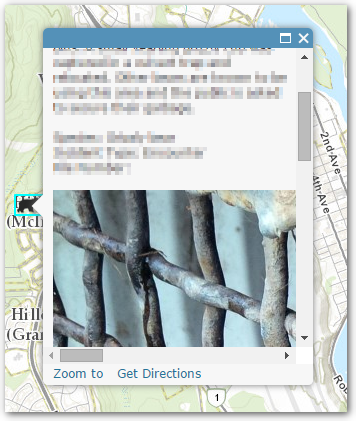 Popup showing 1st image inline, hidden beneath fold are rest of attachments as links. The popup is opened and the attachment urls load and appear as links. A placeholder image (an arrow in my case) is loaded where the image will soon load. Clicking the placeholder retrieves the url from the attachment link and replaces its own source url with the retrieved url, making the attachment image show. URL: data:image/png;base64,iVBORw0KGgoAAAANSUhEUgAAAAkAAAAHCAIAAABV+fA3AAAAGXRFWHRTb2Z0d2FyZQBBZG9iZSBJbWFnZVJlYWR5ccllPAAAADJJREFUeNpi+I8KFi1aBGczMWCAxYsXQxhY5ODS2OUg0jjlYmNjmXBJYDcTIgEEAAEGAGysItsbwoS/AAAAAElFTkSuQmCC (this is just an inline image of an arrow: you can replace it with any other url. You would then have to repeat steps 3-4 every time you publish a new feature. Not ideal or automated, but possible. 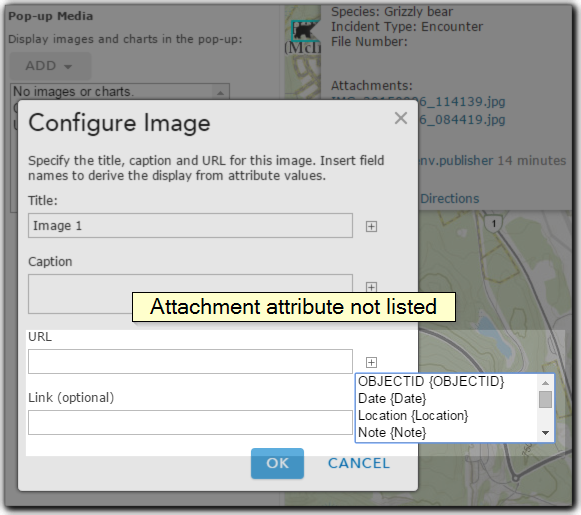 The best way to do this is to use the "Pop-up Media" option under the "configure Pop-up" dialog within ArcGIS online for the layer you want to work with. This should give you the nice clean output you are expecting. Not the answer you're looking for? 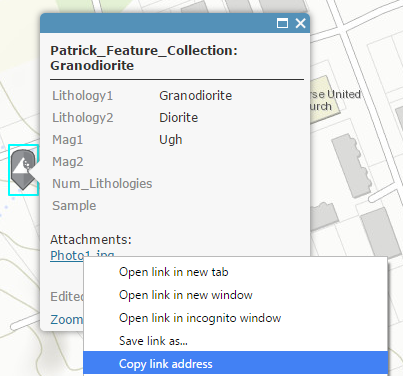 Browse other questions tagged arcgis-online or ask your own question. Changing size of popup on ArcGIS Online? 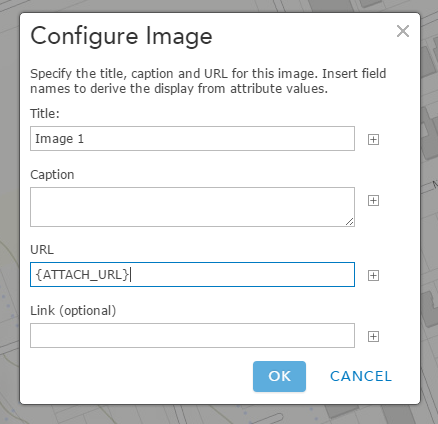 How to configure ArcGIS Server wms to show images in a popup?